Moyer Wins the Battle, Erb Wins the War! 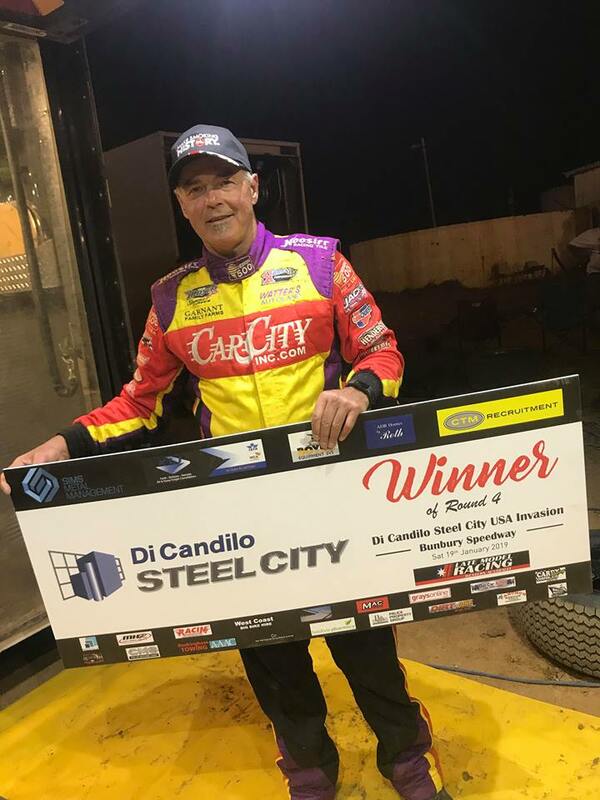 Billy Moyer has tonight claimed the 837th win of his career as he raced to victory in the fourth round of the Di Candilo Steel City USA vs WA Invasion Tour, but it was Tyler Erb who did enough to claim the win in the whole tour, just six points ahead of Moyer. It was a rough and tumble night at Bunbury Speedway, which saw just thirteen of the initial nineteen cars take the green as a number of cars succumbed to issues throughout the heat races. As the duo came out of turn four to complete the second lap Erb went low and just swept underneath Moyer to grab the lead and from here he began to race away. Erb led Moyer, Blake, Michael Holmes and Jamie Oldfield with four complete when Simon McNab spun heavily into the turn four wall to bring out the first caution of the race, with McNab becoming the first retiree. On the restart Oldfield swept past Holmes for fourth and set out after Blake for third as Erb and Moyer again began to pull away. Cameron Pearson also made his moves, passing a couple of cars to be in fifth, then a lap later moved past Oldfield for fourth. Unfortunately not long after he did this, Pearson spun in turn three, with a number of cars lucky to avoid him, but Kye Blight was the unlucky one, slamming into the side of Pearson and bringing out the yellows with six complete. Only Blight was unable to rejoin, leaving eleven cars for the remaining thirty four laps. As the race went green again Oldfield had a look under Moyer but couldn’t make the move stick, Moyer pulling away and again setting out after Erb. Again Oldfield tried to make his way through on the following lap but Moyer was having none of it, again pulling away as Blake and Paul Stubber set out after Oldfield. On lap thirteen Blake pulled alongside Oldfield and went to make the pass. Just as he pulled it off the yellow lights came on as Chris Pavlovich came to a stop in turn four, with Cameron Pearson and Jai Mazzini also becoming involved in an incident with him, twelve laps completed and all three cars out of the race. The remaining eight cars lined up again in an attempt to complete the twenty eight laps left on the clock. Erb would again lead away and just as the race settled again, Moyer closed the gap on Erb and suddenly moved straight underneath him, grabbing the lead and beginning to pull away from Erb in what was a spectacular move. As this was happening Stubber made his way past Oldfield for fourth, the field then spreading out. 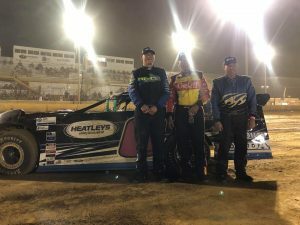 Moyer continued to circulate consistently, approaching lapped traffic on lap twenty five just as Jamie Oldfield retired infield. Lapped traffic was no obstacle to Moyer, working the high and low lines to move past and pull further and further away from Erb, who in turn continued to build his gap on third placed Blake. Fifth placed Michael Holmes went down a lap on lap thirty three, such was Moyers form, his lead out to nearly three seconds. From here Moyer went on to claim a huge win, the 837th of his career and second in Australia, defeating Erb and local hero Brad Blake. Paul Stubber was the only other car to finish on the lead lap, with Michael Holmes, Joe Chalmers and Jay Cardy rounding out the only other finishers. Once the points were all tallied, it was Tyler Erb who had just a six point advantage on Erb, both having claimed two wins, a second and a fifth in feature races, and the difference split by points gained in heat races, such was the tightness of the battle. Michael Holmes was third overall with Jamie Oldfield and Brad Blake rounding out the top five finishers in the overall Di Candilo Steel City USA vs WA Invasion Tour. A huge thankyou to all those who participated in the Di Candilo Steel City USAvs WA Invasion Tour, particularly our four visiting Americans in Joe Godsey, Jeff Roth, Billy Moyer and Tyler Erb, as well as Victorian visitor Cameron Pearson. We can’t wait to see you all next year! Qualifying, 2 laps: 1. Joe Godsey 15.909, 2. Cameron Pearson 16.123, 3. Marc Giancola 16.142, 4. Billy Moyer 16.178, 5. Tyler Erb 16.344, 6. Brent Vosbergen 16.352, 7. Paul Stubber 16.419, 8. Brad Blake 16.784, 9. Jamie Oldfield 16.898, 10. Chris Pavlovich 16.940, 11. Michael Holmes 17.045, 12. Kye Blight 17.069, 13. Jay Cardy 17.143, 14. Jeff Roth 17.165, 15. Simon McNab 17.494, 16. Jai Mazzini 17.510, 17. Joe Chalmers 17.782, 18. Mick Comley 18.394, 19. Willy Powell 18.982. Heat One, 8 laps: 1. Joe Godsey, 2. Paul Stubber, 3. Tyler Erb, 4. Jamie Oldfield, 5. Michael Holmes, 6. Simon McNab, 7. Jay Cardy, 8. Willy Powell. DNF: Marc Giancola (7). DNS: Joe Chalmers. Total Time: 2.13.458. Winning Margin: 5.598. Fastest Lap: 16.057 Marc Giancola. Heat Two, 9 laps: 1. Billy Moyer, 2. Brad Blake, 3. Cameron Pearson, 4. Brent Vosbergen, 5. Kye Blight, 6. Chris Pavlovich, 7. Jeff Roth, 8. Jai Mazzini. DNF: Mick Comley (6). Total Time: No Time. Winning Margin: 1.325. Fastest Lap: 16.073 Billy Moyer. Heat Three, 8 laps: 1. Michael Holmes, 2. Brent Vosbergen, 3. Simon McNab, 4. Willy Powell. DNF: Jeff Roth (7), Mick Comley (4), Paul Stubber (1), Chris Pavlovich (1), Cameron Pearson (1). DNS: Marc Giancola. Total Time: No Time. Winning Margin: 1.056. Fastest Lap: 16.410 Jeff Roth. Heat Four, 9 laps: 1. Tyler Erb, 2. Jamie Oldfield, 3. Billy Moyer, 4. Joe Chalmers, 5. Brad Blake, 6. Jai Mazzini. DNF: Joe Godsey (8), Kye Blight (3), Jay Cardy (0). Total Time: No Time. Winning Margin: 1.417. Fastest Lap: 16.733 Billy Moyer. USA vs WA Race 1, 2 laps: 1. Tyler Erb, 2. Brad Blake. Total Time: 37.788. Winning Margin: 1.539. Fastest Lap: 16.738 Tyler Erb. USA vs WA Race 2, 2 laps: 1. Billy Moyer, 2. Michael Holmes. Total Time: 33.622. Winning Margin: 1.474. Fastest Lap: 16.592 Billy Moyer. Feature, 40 laps: 1. Billy Moyer, 2. Tyler Erb, 3. Brad Blake, 4. Paul Stubber, 5. Michael Holmes (39), 6. Joe Chalmers (39), 7. Jay Cardy (38). DNF: Jamie Oldfield (23), Cameron Pearson (12), Jai Mazzini (12), Chris Pavlovich (12), Kye Blight (6), Simon McNab (4). DNS: Brent Vosbergen, Jeff Roth, Joe Godsey, Willy Powell, Marc Giancola, Mick Comley. Total Time: No Time. Winning Margin: 7.728. Fastest Lap: 16.406 Tyler Erb.